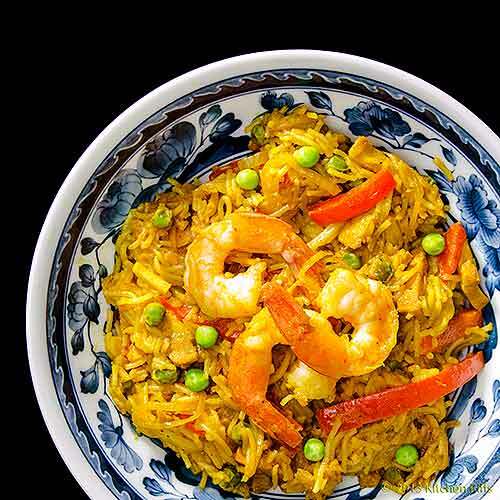 You’ll find Singapore Noodles at Chinese restaurants around the world. This dish offers a spicy blend of noodles and curry, along with veggies and often shrimp, pork, and chicken. I can never resist ordering it when I see it on a menu. If you’re like many of us in the US, though, you’d never dream of making Singapore Noodles (or any other Chinese dish) at home. The ingredients may seem unfamiliar, and some of the cooking techniques can be terra incognita. But there’s really no mystery to it — after all, millions of Chinese folks cook at home every day! Chinese New Year is just a few weeks away. (It begins on Sunday, February 10. We’ll be entering the year of the snake). So isn’t it time to learn a dish or two, and celebrate in style? Almost everyone likes Singapore Noodles — we’re talking pasta, after all. And it’s a fairly easy dish to make (less complicated than spaghetti and meat balls). Best of all, the ingredients will already be familiar to you. Chinese lore says having a snake in the house is a good omen — it means your family will never starve. I’m not sure about that, but I do know this: Learn to make Singapore Noodles, and you’ll never need to eat from those little white cartons again. It’s the curry that makes this dish “Singapore style,” according to Florence Lin’s Complete Book of Chinese Noodles, Dumplings and Breads. The dish gets its name because “Cantonese and Amoy Chinese living in Singapore add [curry to this] favorite,” which “is well known . . . even in mainland China.” I have not visited Singapore, so I can’t say whether people there claim the dish as their own (Wikipedia says it’s barely known in Singapore). But I’ve certainly seen it on many Chinese restaurant menus in North America and Europe. The noodles of choice for this dish are the thin, dried-rice ones (rice stick, or vermicelli). But you can substitute a thicker rice noodle, or even a thin dried wheat pasta (like angel hair). In the US, this dish is often made with chicken, pork, and shrimp. I think including all three is overkill, but go for it if you want. I prefer just pork, or maybe pork and shrimp. You can also make an entirely vegetarian version of this dish — more on that in the Notes. 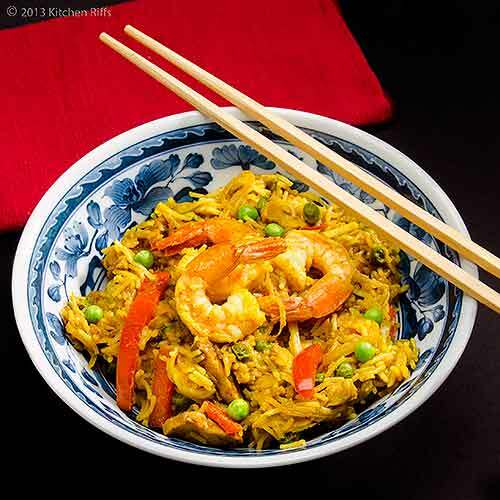 Most recipes for Singapore Noodles are more or less the same. Mine is derived from Florence Lin’s book and from Ken Hom’s Fragrant Harbor Taste. But really, if you eat this dish a couple of times at any Chinese restaurant, you can probably figure out how to make it. Prep time takes 10 to 15 minutes (depending on how long you soak the noodles), cooking time no more than 10 minutes. So figure half an hour, tops, from the time you begin pulling ingredients out of your pantry until you’re eating. This recipe serves 2 to 4 (depending on what else you might serve and how serious your appetites are). Leftovers taste OK when reheated in the microwave, but their flavor isn’t as “bright” as when the noodles are hot from the wok. Place rice stick (noodles) in a bowl, and pour in boiling (or at a minimum, extremely hot) water to cover. Gently pull the noodles apart so no strands are clumping together. Let soak until flexible and tender (usually a few minutes; some recipes specify letting the strands soak for half an hour – unnecessary, IMO). Then drain the rice strands in a colander, rinse with cold water, and gently spread them out on a towel to dry. While the rice noodles are soaking, shred the cooked pork and/or chicken into pieces about an inch long and ¼ inch thick (or a bit less). Peel the onion, cut in half through the poles, and slice thinly (parallel with the onion equator). Wash and dry the bell pepper and cut into slices a third of an inch or a bit less. Peel and mince the garlic and ginger. Heat a large wok or frying pan (nonstick works fine; see Notes) on medium high heat. When hot, add a tablespoon or so of oil (less if using nonstick) and add shrimp. Stir-fry (essentially sauté) briefly until the shrimp colors (if using shrimp that are already cooked, heat until warm). Remove and set aside. Add another tablespoon or two of oil if necessary (exact quantities don’t matter much for this ingredient), and then add the onion and red pepper. Stir-fry until the onion begins to become translucent, about 3 minutes. Add the garlic and ginger and stir-fry for another minute. Add the red chili paste (or red pepper flakes), the curry powder, the stock, and the soy sauce. Add the frozen peas, the shrimp, and the pork or chicken. Stir briefly to combine, and add the noodles. Stir again to combine, cover, and turn heat down to medium low. Cook until the sauce reduces and the shrimp and peas are totally cooked — about 3 minutes. If you wish to substitute a thin wheat pasta like angel hair for the traditional rice stick, here’s how: Bring a 4-quart pot of water to boil, then add about ¾ tablespoon of salt and 8 ounces of pasta. Cook until just al dente (6 to 10 minutes, depending on the pasta). Drain the pasta, spread on towels so it doesn’t clump together, and proceed with Step 2 of the recipe. It’s traditional to use (leftover) roast pork and/or cooked chicken in this dish. If you’re using raw meat, cut into pieces of about an inch long and ¼ inch thick. Marinate in a mix of soy sauce and rice wine (or dry sherry) for 20 minutes or so. After you cook the shrimp in Step 3, cook the meat in the frying pan/wok for a few minutes until nearly done, and set aside. Then proceed with Step 4. You can use fresh or frozen shrimp for this recipe. And if you use frozen, they can be cooked or uncooked. I suggest using shrimp with shells (when using larger ones, I generally leave the shell on a section or two of the tail end). If you’re using frozen uncooked shrimp, they will take a bit longer to cook than fresh or precooked. So just allow additional time in Step 3. You can find red chili paste in the Asian section of your supermarket. It’s often sold as chili/garlic paste, which is fine in this dish. Sriracha sauce has a somewhat different flavor profile, but works well in this dish, so that’s another possibility. If you don’t like spicy, omit the chili paste (or red pepper flakes). Everyone’s tolerance for spicy is different, so tailor the quantity of hot stuff to your preference. In fact, virtually all the ingredients and quantities in this recipe are highly elastic — vary to suit what you have on hand, and what sounds good to you. Many recipes for Singapore Noodles drop the protein (pork, chicken, shrimp) and go entirely vegetarian (use vegetable stock if you want to do this). Chopped celery is good in this dish, as are chopped canned water chestnuts, bean sprouts, or almost any vegetable you can think of. You may want more soy sauce than I suggest — I usually add a bit more at table. Fish sauce is a nice addition too. Some recipes suggest adding salt to taste. I find that unnecessary, since soy sauce is salty enough, although you may disagree. Some recipes suggest adding a teaspoon or so of sugar to this dish. Again, I find that unnecessary, but you may enjoy the result (add it in Step 5). “So snakes in the house are a good, omen, huh?” asked Mrs. Kitchen Riffs, attacking her Singapore Noodles. “That’s what they say,” I replied between bites. “Wish we’d known that when we were living in Florida,” she said. Ah, yes, Florida. The west coast thereof, to be specific, where we lived for years. With snakes, lots of snakes (mostly small and non-poisonous, fortunately). They often turned up around our pool, looking for a free chlorinated cocktail. And our cat, Kitty Riffs, rarely missed an opportunity to bring them into the kitchen. “So if we’d known, we’d have been less freaked about serpents under the sink?” I asked. True. Maybe those omen guys were on to something. Holy moly, this looks fantastic! And easy? Why have I not made this earlier? Hi Cathleen, this dish has fantastic flavor and is so simple! And if you have all the ingredients on hand - I usually do - it takes practically no time to make. Thanks for the comment. Wow this dish is full of flavor. I love these types of one dish meals. Great recipe! Isn't it funny how dishes that are foreign to us seem so difficult to make, but as you said there are people who make them every day at home! Thanks for the challenge, I usually stick to my weekly recipes but lately have been challenging myself to try things new and foreign to my cooking style, its been a lot of fun. Great recipe! I love dishes like this that allow me to use whatever protein I have on hand. This looks fantastic! Anything with noodles makes my family happy. Hi Kristi, hot dogs are pretty exotic in some parts of the world. ;-) This is such good stuff, and once you begin making your own, it'll be a dish you make often. Thanks for the comment. Hi Kristi, I think almost everyone likes noodles! And the rice ones are a bit lighter, too, which is a plus. Thanks for your comment. Hi Uru, aren't pantry cleaner recipes nice? And so handy - they tend to be pretty flexible, which is nice. Thanks for the comment. Hi Vicki, tons of flavor! ;-) And really quick to make, which can be handy on busy days. Thanks for the comment. It is amazing that a few of us prepared shrimp in the past few days! Mr. and Mrs. Riff, this is amazing on every level possible. Every ingredient mixed together seem perfect and complimentary in taste to each other. I love Kikkoman! That last picture is absolutely perfect!! Hi Charlie, Western Florida is probably the snake capital of the US in terms of numbers per acre, or some such metric. Even if you're not a snake lover (most of us aren't) you get used to it. Kinda. ;-) Thanks for the comment. Hi Judy, yeah, your coconut shrimp looks wonderful! And this is such a wonderful dish - and easy to make, thank goodness. Thanks for the kind words, and the comment. Very nice recipe ! 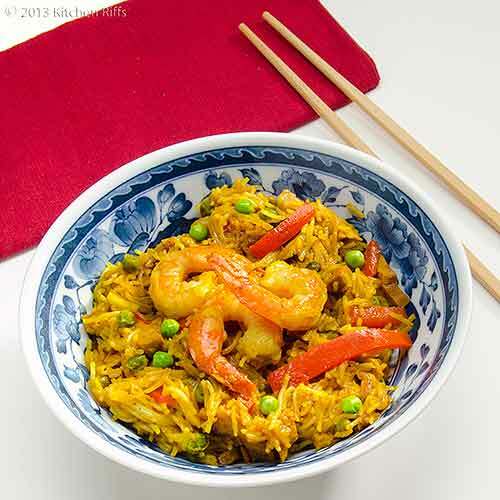 I've had Singapore noodles a few times and I love the flavour the curry powder gives them! So delicious! These are delicious flavours and I love the prawns. I'm not so sure about a snake in the house either. Look at those wonderful prawns. Delsih! Great post! Although I don't make this at home every week but it's one of those dishes I make regularly. When I do make it I tend to make in bulk so I can save it for a second meal (yeah I love this dish). Great work on explaining the details on this popular Asian dish. Thanks for sharing it! I love Chinese food and this recipe. I don't about the snake thing though. Hi Natalie, I like anything with curry, and being able to combine it with pasta rocks! This is such a great dish. Thanks for your comment. Hi Suzanne, the snake thing is kind of a bummer, but there's nothing that's a bummer about this dish - it' truly good. Thanks for the comment. Hi Raymund, tons of flavor in this recipe - I think you'd enjoy it. Thanks for the comment. Being a European born Australian i have had the good fortune to transit or visit Singapore for dozens of holidays with a very foodie family! 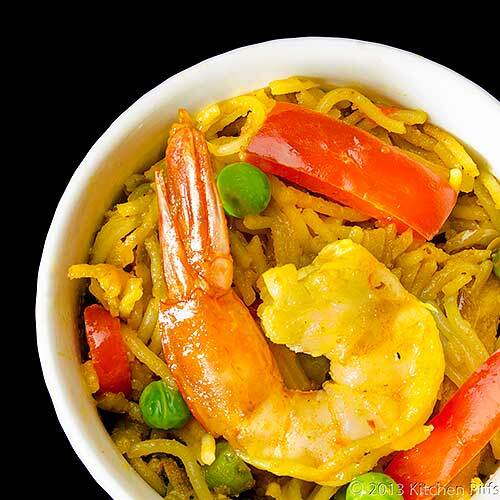 I am afraid I have never come across Singapore noodles using curry! Methinks Wikipedia just may be right. There is an Indian section in Singapore around Apollo Road etc and of course curries are available there, but I do not think they could be termed 'Singaporean'!! That said, my traditional first night meal in Singapore [almost for good luck and a great stay] has always been Hokkien Prawn Mee - beautiful Hokkien noodles in a super tasty Chinese sauce with quite a few of the ingredients your recipe includes, topped with large prawns, piles of hot, hot chilli slivers and green onion strips. I would cry and my nose would be unmentionable and I truly would think I was in heaven :) ! Definitely NO curry spices!!!!! Hi Yi, isn't this such a great dish? I definitely need to make it more often than I do - terrific flavor, and it just makes me happy. Thanks for the comment. Hi Dawn, that snake thing is a bit weird, I agree. But this dish is fantastic, and one of my all time faves. Thanks for the comment. Hi Karen, this dish is a noodle lover's delight! ;-) Thanks for the comment. Hi Eha, thanks for the report from the field! And it is odd that this is called Singapore Noodles when the dish apparently doesn't exist in Singapore. However, it's good stuff, and I'm grateful to whoever devised it. Thanks for your comment. I'm making this tonight because it's hot and it only takes 10 minutes and I can cook it on the wok outside. Thanks! This is what I know. Our house is surrounded by snakes which is why I hate working in the garden. Whatever. I will take that as a good omen and I need all the good omens I can get.In any case I love singapore noodles. Good choice. Good recipe. Hi Maureen, we'll be enjoying your hot weather in a few months! And when it's hot, cooking this outside makes so much sense. Enjoy! Thanks for the comment. Hi Marina, you could certainly do that! I normally plan a bit when I make this, but it's a really flexible and adaptable dish - almost anything works in it. Thanks for the comment. Hi Abbe, we never really grew to like snakes when we lived in Florida, but we grew accustomed to them (except in the house; whenever Kitty Riffs would bring one in, we instantly sprang into action to remove it). Aren't Singapore Noodles wonderful? I need to make this again soon. ;-) Thanks for the comment. I saw the yellow color and was surprised to see that is came from curry powder. Wasn't expecting that. What a beautiful bowl of protein and vegetables! The "sauce" sound quite spicy with the red chile paste. YUM! Great meal! Hi MJ, even though I know a lot of traditional Chinese dishes use curry, I'm often surprised when I see it! A lot of the recipes for this dish don't use chile, but I think it adds so much. Thanks for the comment. Hi Anne, this actually is a pretty easy dish to make. And there are probably 3 or 4 different ways to make it (although they're all similar). I hope you enjoy it! Please do let me know how it turns out. Thanks for the comment. This looks so good. I love Singapore Noodles! I always order them at restaurant and not making at home. But guess what, I have all of these ingredients at home all the time. I guess I should be making my own from now on. :) Thanks for the inspiration. How fun to see an Asian dish on your post and how thoughtful to share some Chinese dishes for CNY! I hear Singaporean Noodle before but never tried it before. There are so many kinds of noodles to choose. I'll definitely have to remember to try too. And it is easy to make at home too as ingredients are very familiar. Thanks for sharing John! Please don't banish me from Kitchen Riffs but I've never tried Singapore Noodles. If I'm going "Asian" for dinner, I'll more often go with a Japanese restaurant first, Thai second, and Chinese third. I just don't think to "go noodles" when it's China's turn to feed me. This, however, sounds delicious, John, and, compared to most, there's not that much chopping and dicing to do in the prep stage. In short, I could make this -- something I rarely say about the cuisine from that part of the World. Thanks, not just for the recipe but for the helpful explanations and how-to's. This was a great post. As we have tried to make our restaurant favorites at home, we have been pleasantly surprised how quick and easy it is. A big fan of curry, this recipe sounds delicious and as easy to prepare as others we have mastered in our own kitchen -- Thanks for the recipe! Hi Amy, this is such a simple recipe, isn't it? The only tricky part is figuring out much curry you like, but the experimentation is a lot of fun. ;-) Thanks for your comment. Hi Nami, there are hundreds of different Asian noodle dishes! And they all seem so good. Although these are one of my faves. Thanks for your comment. Hi John, you have the pleasure of trying these before you! If you like curry, you'll like these. China, particularly Northern China, has oodles of noodle dishes. Often they're served in broth (as a sort of soup - same concept as ramen) but not always. So much to learn and eat, so little time. ;-) Thanks for the kind words and the comment. Hi Marta, isn't this a great dish? I actually think this may be a bit better with just pork (no shrimp or chicken), but the shrimp look so pretty! Thanks for the comment. Hi Judy, this dish is totally fun and easy to make. Well worth the effort to learn how to do it, IMO. Such tasty stuff! Thanks for the comment. This is my husbands absolute favorite dish! Have you ever tried it with just a touch of red wine vinegar on top before serving? Sounds weird but it's really good! Reading your post, I must tell you this... I was born and lived in Singapore for more than 25 years and I never eat any Singapore noodles when I was living in Singapore. It is true that we never have any Singapore noodles in Singapore! - LOL! We have different kinds of noodles but never the same taste as the Singapore noodles that we eat in US and Australia. The funny thing is this noodles only exist in US and Australia. Your Singapore noodles look great... Now that we are living in Australia, we like to eat Singapore noodles too - LOL! Hi Allyssa, the touch of red wine vinegar sounds like a great idea. I haven't tried it that way, but I will. Thanks for the tip, and the comment. Hi Zoe, thanks for the confirmation that these noodles indeed don't exist in Singapore! So odd they have that name, but some recipe names don't seem all that based in reality. Thanks for the comment. Thanks for sharing the recipe...and have a great week! Hi Carolyn, isn't this a great dish? I admit it's one I crave, too, if I go too long without eating it! Thanks for the comment. Hi Juliana, thanks for confirming that despite the name of this dish, it's apparently unknown in Singapore! Still a great tasting dish. ;-) Thanks for the comment. This sounds spectacular. Chinese New Year is not enjoyed by the dogs in our house due to all the fireworks, but I'm always excited for an excuse to try a new dish. YUM! Hi Shut Up and Cook, our cat isn't too fond of those fireworks either. This is truly tasty stuff - I hope you enjoy it. Thanks for your comment. The noodles looks mouth watering. The curry flavor sounds interesting. I never tried that one even though I had been to Singapore. I was out for a short vacation and missed out lots of good recipes from my daily visiting of blogs. Glad you visited my blog and posted the comments during my absense. I have lot to catch up!!! Hi Shibi, hope you had a great vacation! And this is a great recipe, although apparently it's unknown in Singapore (despite its name!). Still, it's good no matter what it's called. ;-) Thanks for the comment. Funny that you posted a shrimp recipe, because I have shrimp thawing right now for tonight's dinner. Was thinking about something spicy as well. Hi Julia, shrimp makes such a nice and tasty main course protein, doesn't it? And if you were thinking about something spicy, this sounds like it's perfect! Thanks for the comment. Bring on the year of the snake. I love Chinese food, we cook it regularly at home, it is simple to add extra ingredients; soy sauce, fish sauce or more chilli. They are so flexible. I have to admit though I have never tried to make Singapore Noodles, as I don't think I have ever eaten a good one. Would love to give it a try though. Hi Liz, I find that once you learn (and acquire!) the ingredients, Chinese cooking is pretty straightforward and easy. Well, much of the time. ;-) If you like pasta and curry, you should give Singapore Noodles a try - really tasty stuff. Thanks for the comment. Wow, I had no idea these were soo easy to make! Singapore noodles have been a longtime favorite of my mother and I ever since I can remember. Thanks for posting, definitely will be trying this one out! Hi Christine, these really are easy to make. And as you said, they're delish! Definitely worth making at home. Thanks for the comment. Hi Bam, some I have bookmarked, others I follow by email. No real system - I should devise one, because I do visit a fair number of blogs. And I can imagine Hong Kong is a frenzy of activity! Thanks for the comment. I love, love, love Singapore noodles. I think because they remind me of pancit. So tasty and your dish has such great color. Hi Food Jaunts, I've never had pancit but definitely need to try them - I love all kinds of noodles! Thanks for the comment. Darn if I had know serpents were good luck in the house I wouldn't have eaten all those breadsticks. Much safer than keeping a real snake in the house. We had rattlesnakes at our old house, I hope I never hear one of those again. Much prefer to have a big plate of your noodles. Hi Gina, ;-) That snake thing is interesting and all, but I'm with you - no snakes (except those wonderful bread ones you made). Thanks for your comment. Hi Carina, I've heard that snake tastes like tender chicken (lots of things seem to taste like chicken, don't they? ), but I have to admit I have no desire to find out for myself! Thanks for your comment. I've never heard nor eaten Singapore noodles before...I need to remedy that quickly! Hi Lizzy, you really should seek these out - they're wonderful. ;-) Thanks for the comment. Exactly terra incognita! But then the ingredients in your Singapore noodles look pretty familiar, kind of Indian. Not surprised after all Singapore is very multicultural. Looks splendid! Hi Helene, these ingredients would indeed seem familiar to anyone living in India! Sounds like the year of the snake has been good to you - or at least your garden - thus far. ;-) Thanks for the comment. This recipe, as well as the hot and sour soup, sound perfect for a cold day like today in Atlanta. I'm excited to try these out and have my own Chinese dinner without leaving home (for reasons unexplained, I often leave Chinese cooking out of my home kitchen repertoire) with my squeeze. Hi brittnicgrace, both this and the soup are great for cold weather. And both pretty simple to make. Thanks for the comment. Hi dentistvschef, there are so many different noodle dishes, and all of them great! Hard to go wrong with any of them. Thanks for the comment.